So recently I went to Beamish Hall in County Durham for one of my best friends’ baby shower. We all planned a lovely surprise get together for her and her husband, and what better way to celebrate than with cake!! I’ve had afternoon tea before but it’s not often something I would choose if I’m honest. 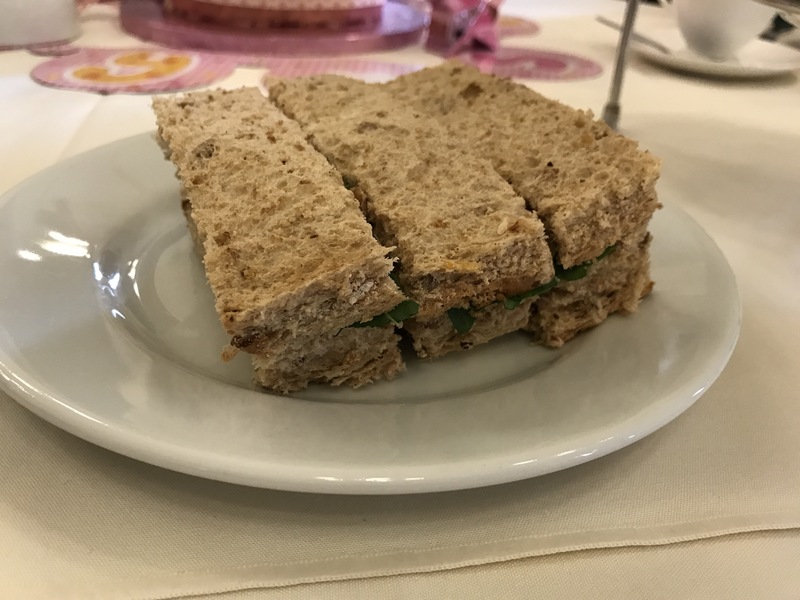 I’m a fussy eater and I find the sandwiches aren’t really me, I’m a plain tuna mayo kind of girl, not so much fancy fillings or salad, so I have to weigh that up against my love of cake! 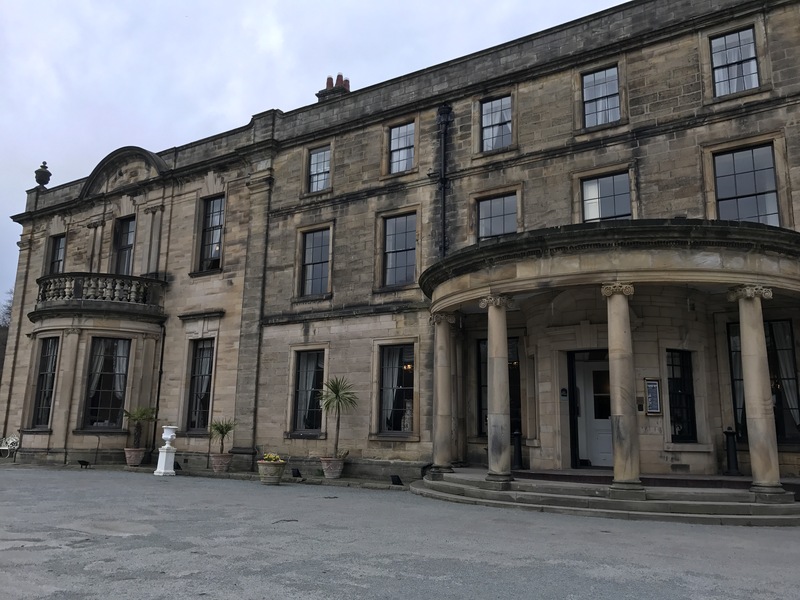 On arriving at Beamish Hall I had to navigate the narrow doorways with a pram and several bags to get to the Eden Tea Rooms on the second floor where afternoon tea was served. I didn’t realise it was upstairs, but I’m not sure how I could have carried less to make my life easier! Luckily there was a lift, but it was pretty small. Me and Grace just about squeezed in, but I think if you were in a wheelchair you wouldn’t get anyone else in there. There were more stairs to get into the tea room though, so I had to have a hand with the pram, not ideal. The tea rooms were large and the tables were set out nicely, so even though we were a group of about 18 we weren’t squashed in with any other guests. The staff were also happy for us to decorate the table with balloons and bring our own cake which was great. When everyone had arrived and got settled we looked over the menu, I was surprised at the choices. Not only was there the Classic Afternoon Tea there was a speciality choice on offer which had more savoury options (including scotch eggs and sausage rolls). I went for the Classic choice but a couple of people went for the special and gave it rave reviews. There was also the option of a sandwich on its own or High Tea (scones with tea or coffee). I thought the variety on offer was really impressive. With the Classic Afternoon Tea I had to choose a sandwich from the menu. No selection of random combinations here, I could pick the one I liked best! Big thumbs up from me. I chose tuna with lemon mayo and black pepper, and this came with two mini scones and four cakes. It was one of the biggest sandwiches I’ve ever seen! Double layered with tons of filling. I could have easily just had this, but of course I wasn’t about to leave the cakes! I tried the plain scone with jam and cream, and it was delicious. 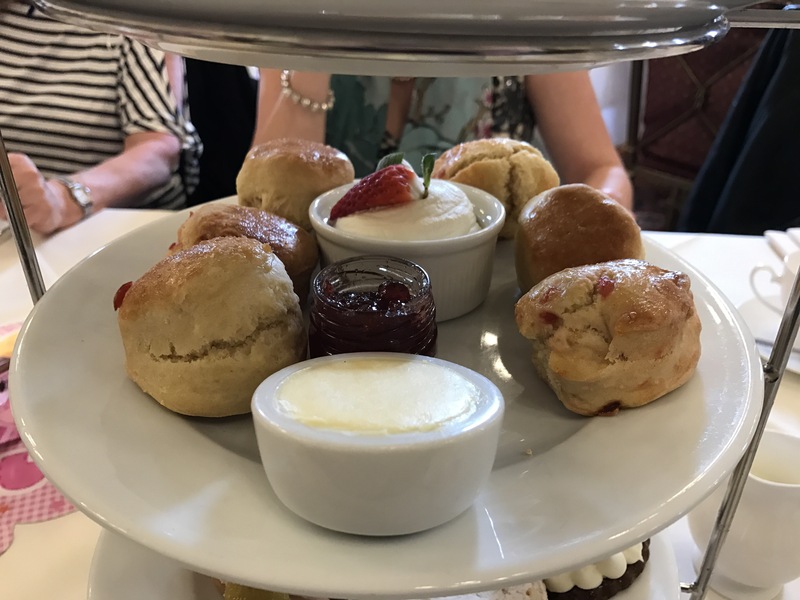 The other was a cherry scone, I’m not a fan of cherries and I was already pretty full so I left it so I would have room for cakes which looked incredible! 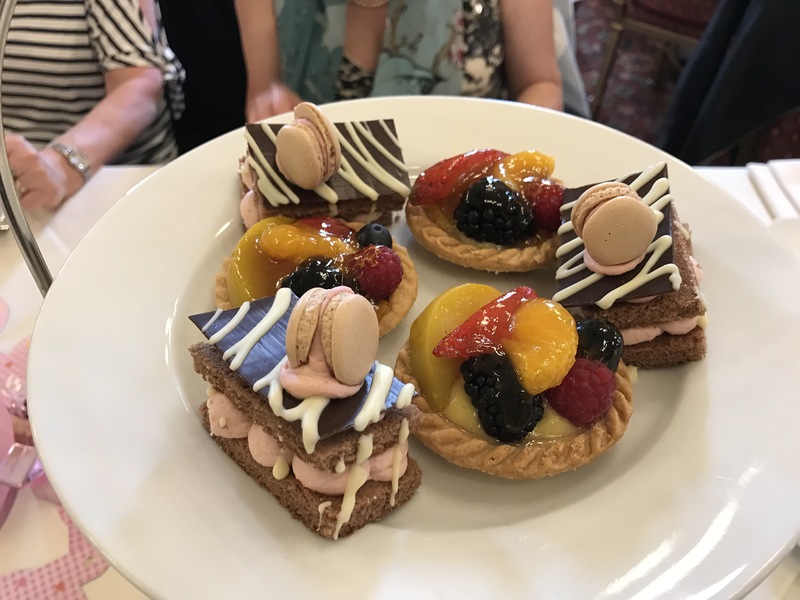 As I mentioned, there were four cakes, a fruit tart, a Bakewell tart, a toffee apple mousse on a biscuit and a chocolate and raspberry stacked sponge with a tiny little macaron. It was a hard decision which to pick first and they were all so good! Not one disappointed and you could hear everyone’s noises of delight as they tucked in round the table. 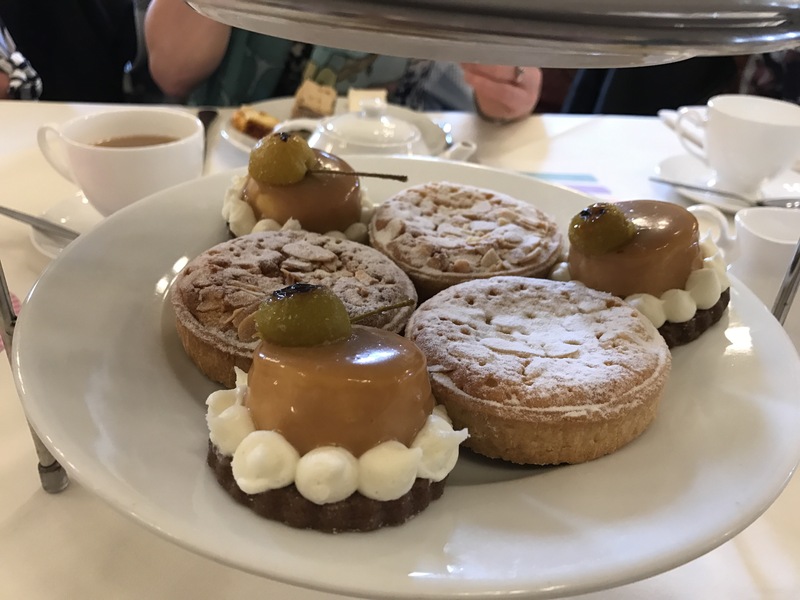 I think my favourite bit would be a toss up between the sandwich and the toffee apple mousse cake, but all in all it was my favourite afternoon tea experience. I would recommended it to anyone, whether you just fancy a trip out for a nice treat or for a special occasion. I’ll definitely be going back! Oh my! I was starting to feel hungry before reading this. Now I’m ravenous. For cake! !